The extraordinary, ground breaking New York Times bestsellers The Hunger Games and Catching Fire, along with the third book in The Hunger Games trilogy by Suzanne Collins, Mockingjay, are available for the first time ever in a beautiful 3 book edition. Stunning, gripping, and powerful. The trilogy is now complete! 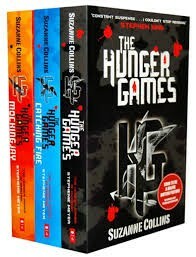 The Hunger Games are excellent books! The first book took me a little while to get into, but once I did, I really enjoyed it. The second and third book kept my attention from the very beginning. My child is in LOVE with the Hunger Games. She had read every book and saw every movie that came out so far. I knew that I had to monitor what she was reading. When I heard her asking me if I can buy it for her, I did some research on the book first. I knew there were some violent and graphic scenes, but I knew she was mature enough to handle it as a fifth grader. It depends on how your child would take it. There can be some scary parts, but she knows that all of it is fake. She just loves the books and I think it's great that she's reading a lot. I surely would recommend this book.